I received a piece of cloisonne this week broken and wanted to share the repair process. The piece was dropped and the enamel had completely separated from the fine silver base. Here in the photo the broken piece is sitting on a new sheet of fine silver, that has one layer of flux fired on its front, and four layers of counter enamel fired on the back of the new base . I filled the backside of the enamel piece with a very thin coat of flux, hoping this would give it a solid bond to the base, when fired. There were some cavities on the back of the broken enamel piece from the separation of the base, here I added a bit more flux, hoping to keep the enamel from sinking or forming bubbles. Next, the piece was fired in a kiln at 1400 degrees. You can see in the photo the base silver is larger then the broken enamel piece. Once it was fired and the broken enamel piece fused to the base, I could clean the edges of the enamel piece that was discolored. It was too fragile to attempt this prior to attaching it to the base. I used a diamond ball bur to clean around the edges. The holes in the enamel piece are where bubbles did form. I needed to remove these to prevent the piece from cracking in the future. A diamond ball bur was used again, to bur through the enamel and open the bubbles. The right hole is not burred out completely. I wanted you to see what to expect as you are drilling. This is a small pin hole which will open into the whole bubble as you proceed. The left bubbles have been opened completely, which is necessary to allow the enamel to flow smoothly into the opening. In the third photo you can see how smoothly the enamel flowed into the openings. Even though the enamel is lower than the cloison wires, which you would expect, I have a choice to fill with matching color, or sand down the high spots. One very important point is to fire the enamel piece you have used a diamond bur on before adding new enamel. If you add enamels to the burred area, then fire, you will have shadows in the finished enamel piece. I have also seen burnish marks in the enamels after drilling out the bubble and have concluded it can from the diamonds being worn off the bur. In this case get a new diamond bur and go over the surface are to remove the burnish marks. I have used Arkansas stones as well for repairs. All set and ready to go back to the owner! 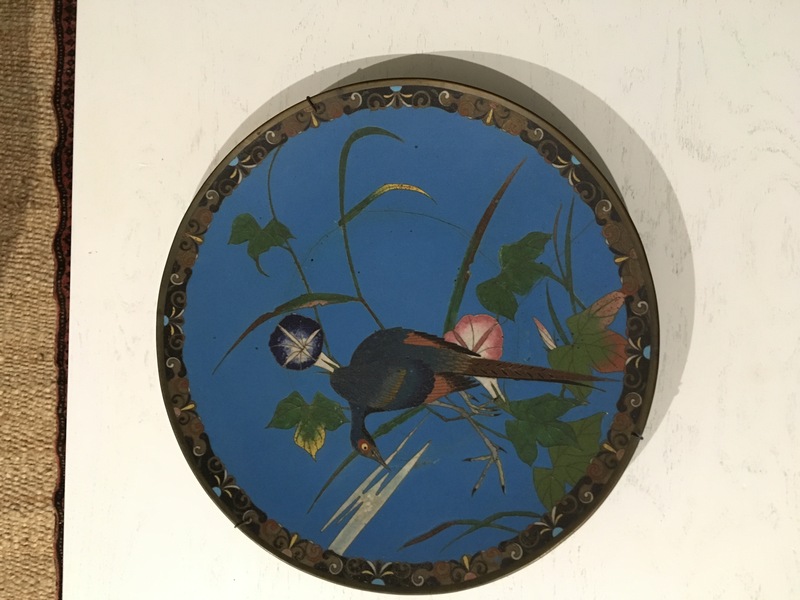 I have two Cloisonné plates which belonged to my grandmother that I would like to hang in a particular spot by a window in sunlight in my house. I live in New Zealand where the UV is very high. Will the plates fade in harsh sunlight or should I rethink the position? Maryann, Sun light will not fade the enamels. Enjoy your treasures! I have a piece of newly-purchased jewelry (an enamel and fine-silver bracelet) that was intended to go with a set. 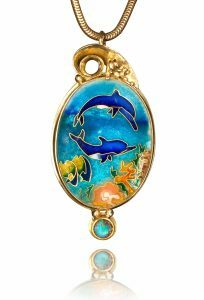 The matching necklace is painted exactly the same, but of a lighter, blue hue. I love this bracelet, and had been looking for it for over a year. It’s perfect, I’m just perplexed as to what to do about the darker blue hue. It’s obviously the same color – but was more heavy-handedly applied – making it appear darker. Though it would be easier to darken the enamel to the necklace, I prefer it’s lighter coloring to the darker enamel of the bracelet (you can see the details of the piece for clearly in the lighter enamel). My question is, because it’s a transparent turquoise colour, could exposing it to sunlight/UV, lighten the piece just a bit for me? I do not see images attached to your question. But sunlight will not fade the color in enamels.